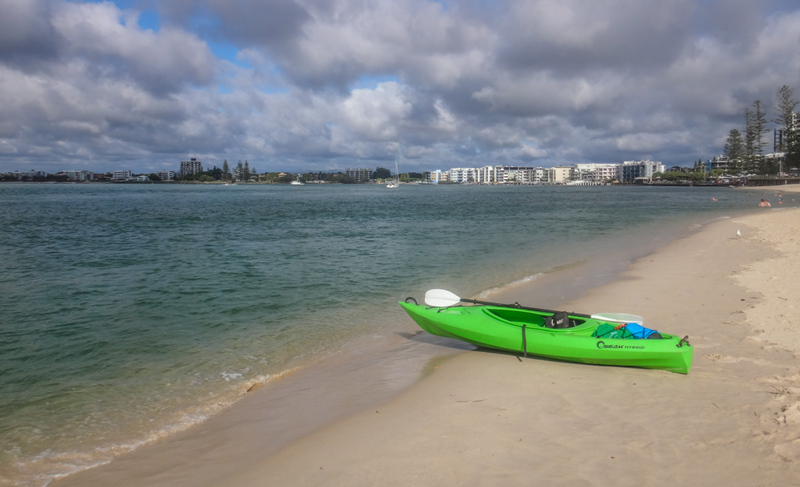 During a weekend break at Caloundra, I thought it would be fun to explore the Bribie Passage with a couple of friends in the kayak. 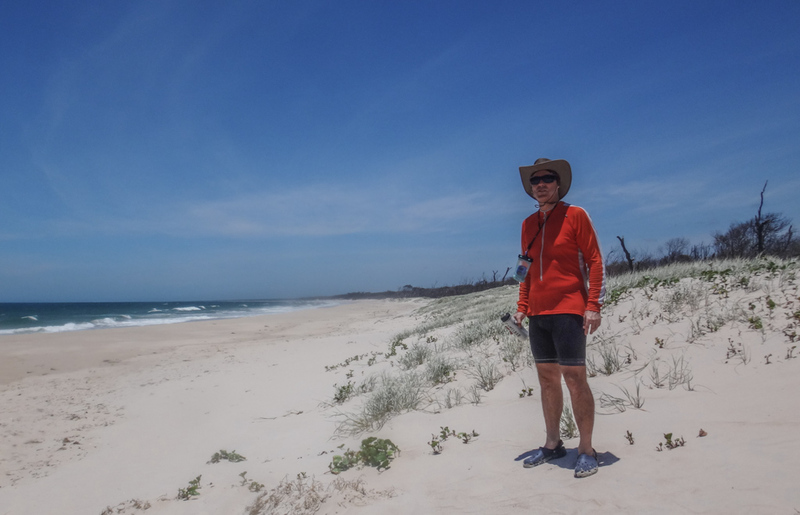 We were staying near Bulcock Beach, so I decided to “put in” (I’m starting to learn some new seafaring terms) at Bulcock Beach. 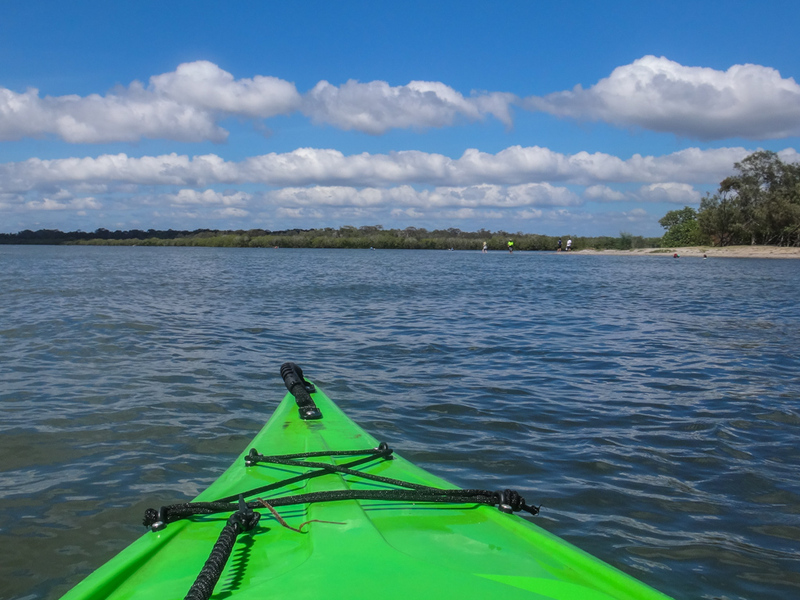 With a gentle incoming tide and no breeze, it was an effortless glide up the Bribie Passage towards Golden Beach. 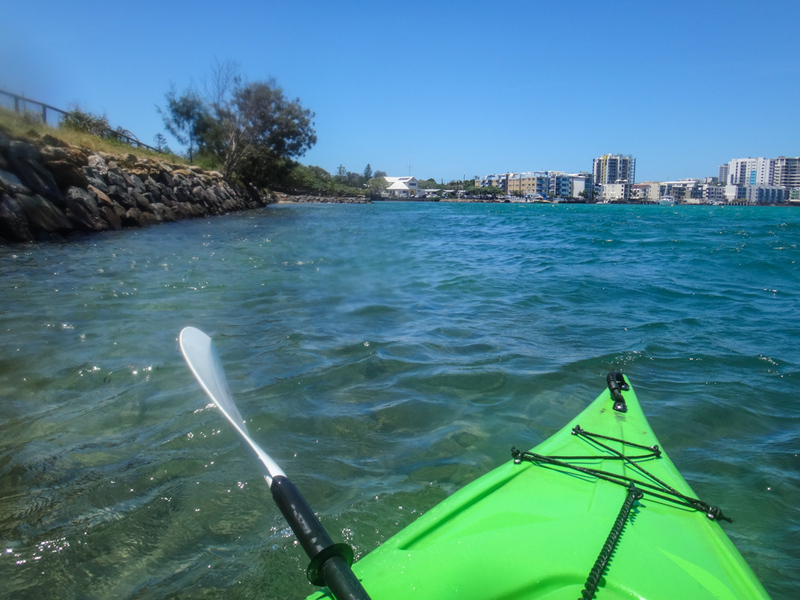 I thought smugly to myself that one big difference between paddling and pedalling is that if you pick the tides correctly it might be possible to “roll” downhill for most of the day, using the favourable current in both directions. 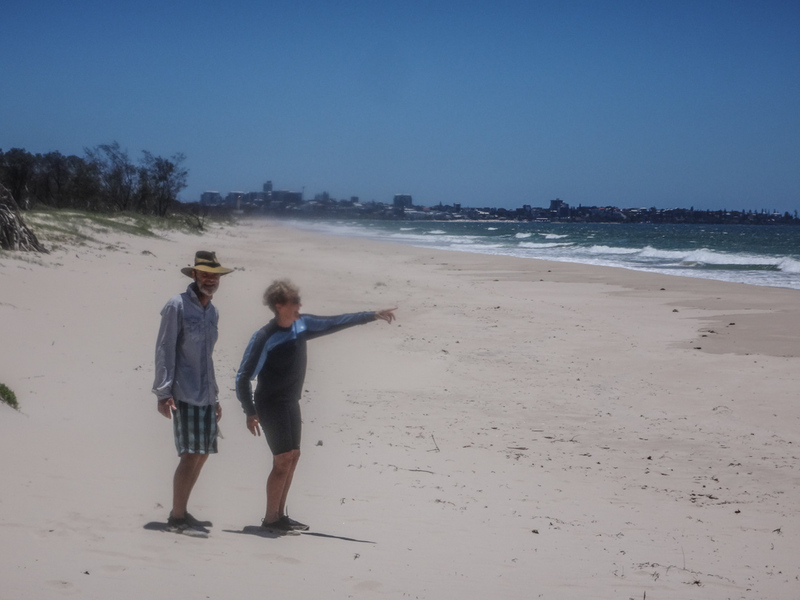 I had agreed to meet Calum and Ruth at Golden Beach – just ten minutes paddle away. 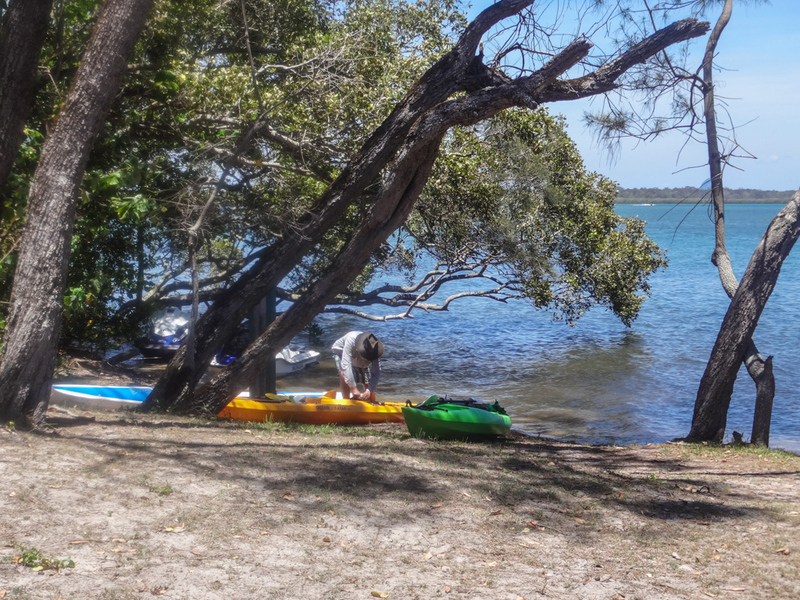 Parking there is easier than at Bulcock Beach, and the water is calmer. 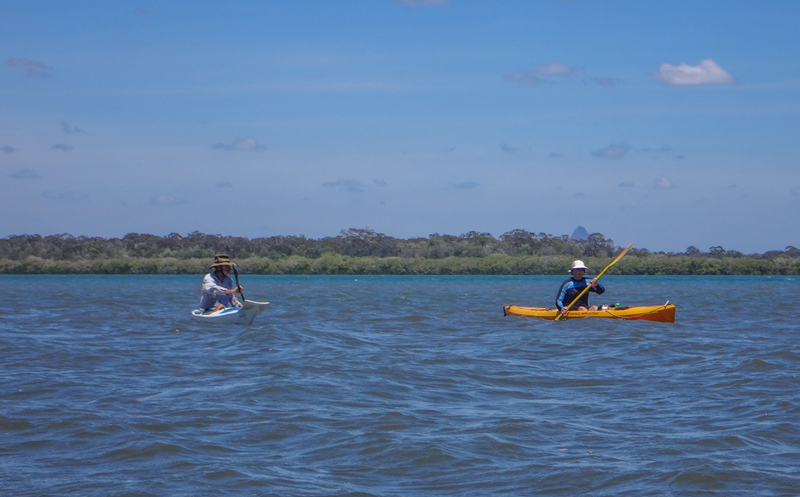 After a few pleasantries, we slid out on the smooth water and up Bribie Passage. 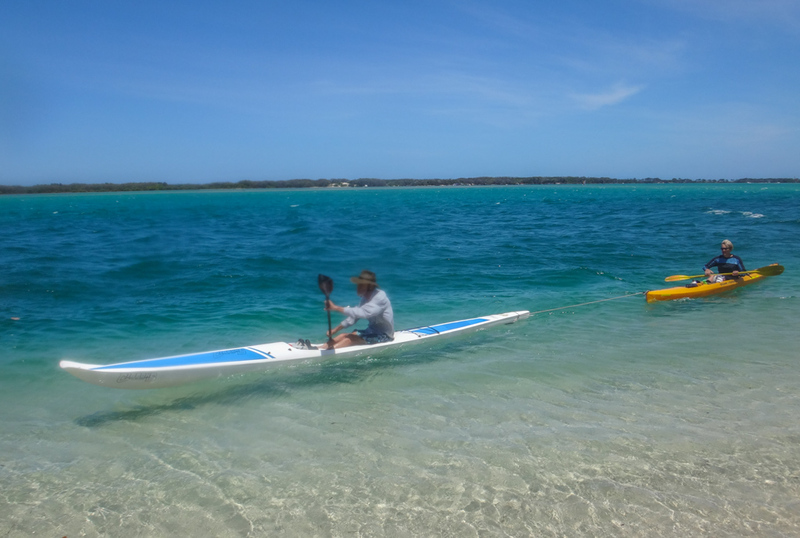 Calum and Ruth had a couple of sleek-looking sea kayaks. Long and narrow, they cut smoothly through the water. The water around here is shallow. 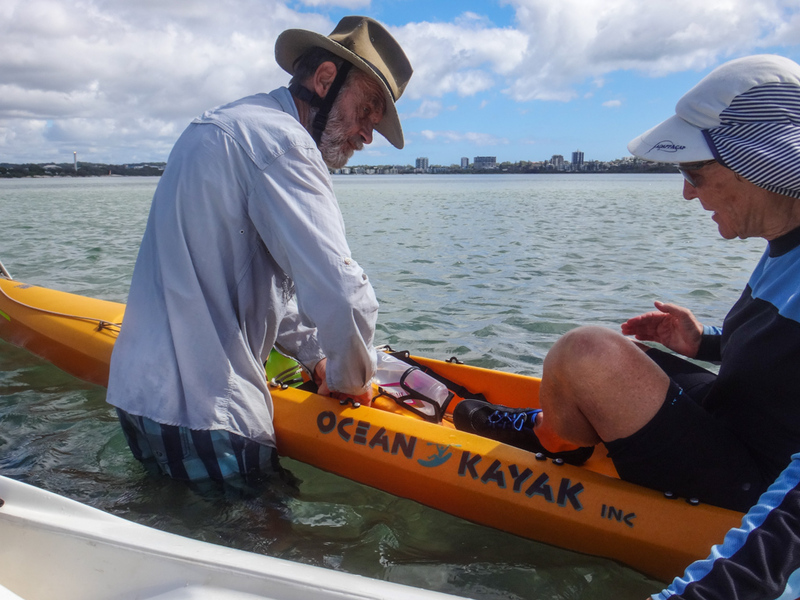 When Ruth needed a minor adjustment, Calum just slid off his boat into the thigh-deep water, made a few mechanical changes, then jumped back aboard. Easy! While Calum worked his mechanical magic, I asked Ruth about her passion, Yoga. Ruth has been teaching Yoga for more than seventeen years and runs Pine Rivers Yoga where she teaches a number of different courses. “So is Yoga a means to an end, or an end in itself?” I asked her. “I have trouble even touching my toes,” I joked. “You should try it!” she suggested. Before I was able to sign up, Calum had finished his repairs, and we were on our way. 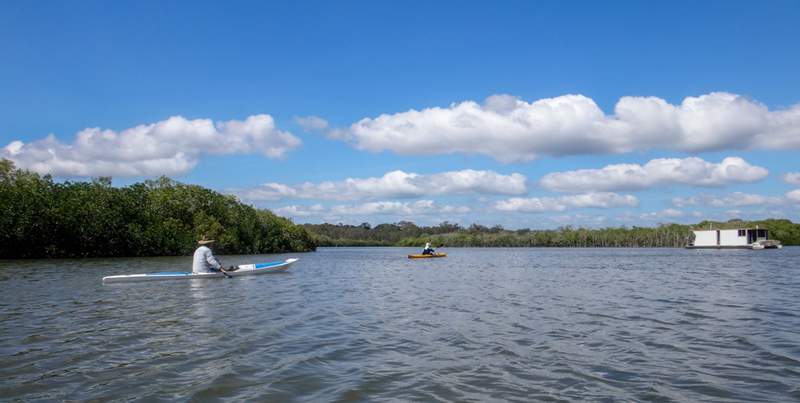 In the distance, jet-skis skidded over the water, engines droning like angry hornets, large plumes of water at their tail like dangerous stings. We watched them warily, eager to stay out of their way. A few minutes later we reached the entrance to Bells Creek. 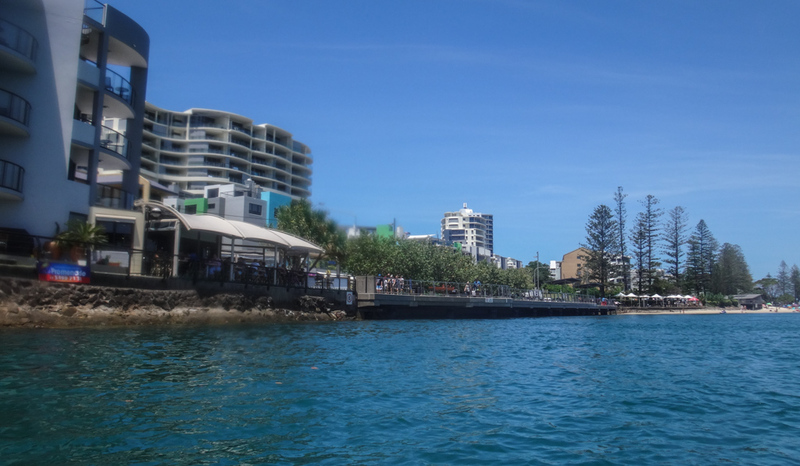 We’ve ridden the mountain bikes near here previously, so I was curious to have a look from the water. 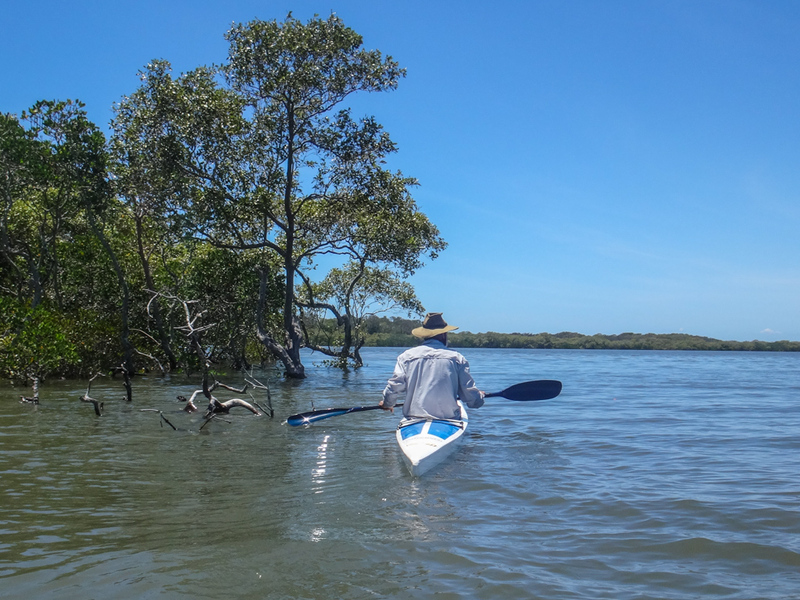 We meandered upstream, past numerous moored houseboats, and around a maze of mangrove islands. 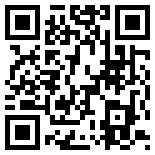 I was grateful for my GPS dangling around my neck which gave me clues about the best way to go. 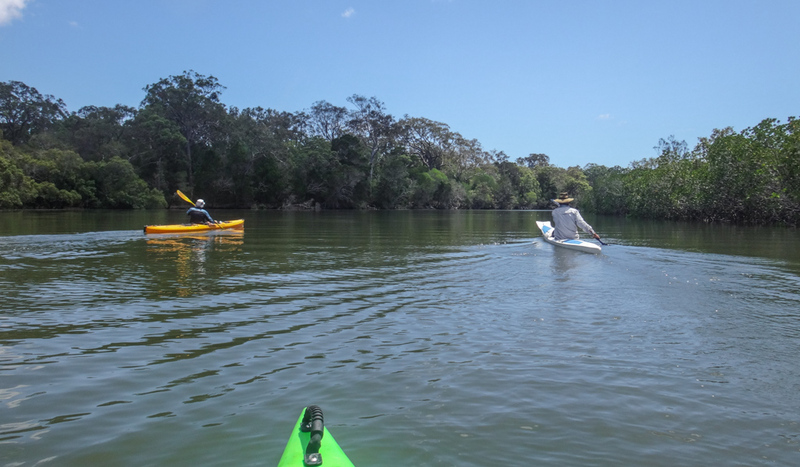 Out of the breeze, in the shelter of the trees and mangroves, we paddled effortlessly over the smooth creek surface. 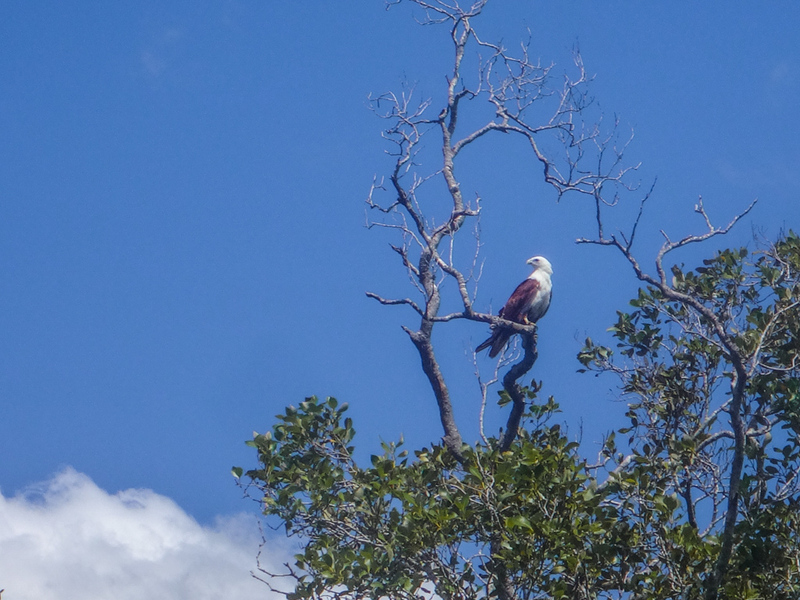 A Brahminy Kite looked down at me trying to decide if I was edible. I kept my head down and tried to look as unappetising as possible. 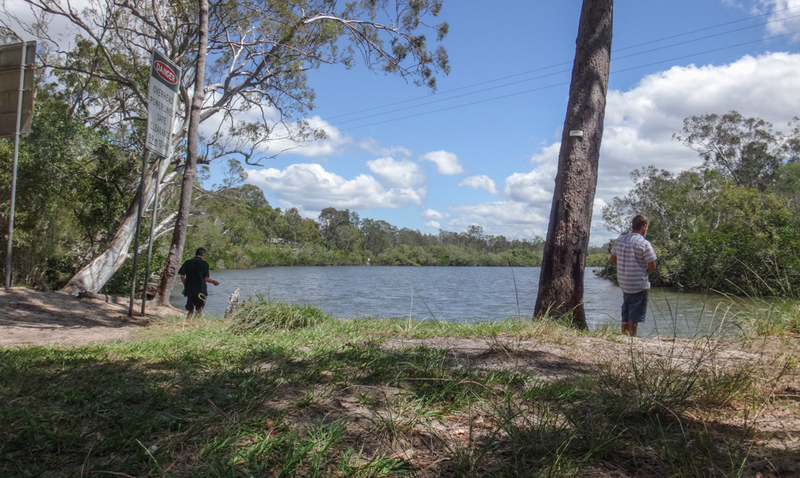 A few kilometres upstream, we came ashore at a boat ramp. Fishermen stood quietly on the shoreline while we pulled the kayaks up on the creek bank. Odd-looking metal wreckage sat partially submerged near the boat ramp. What was it? An old boat maybe? An old bridge? I had no idea. 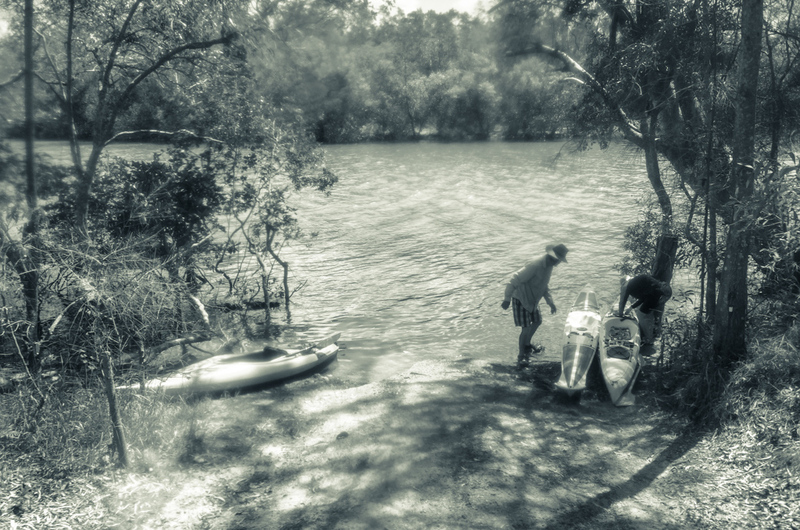 After a short break, we got back in the water and started back downstream. The tide had turned. It was time to “roll downhill” on the outgoing current. The wind started to freshen. 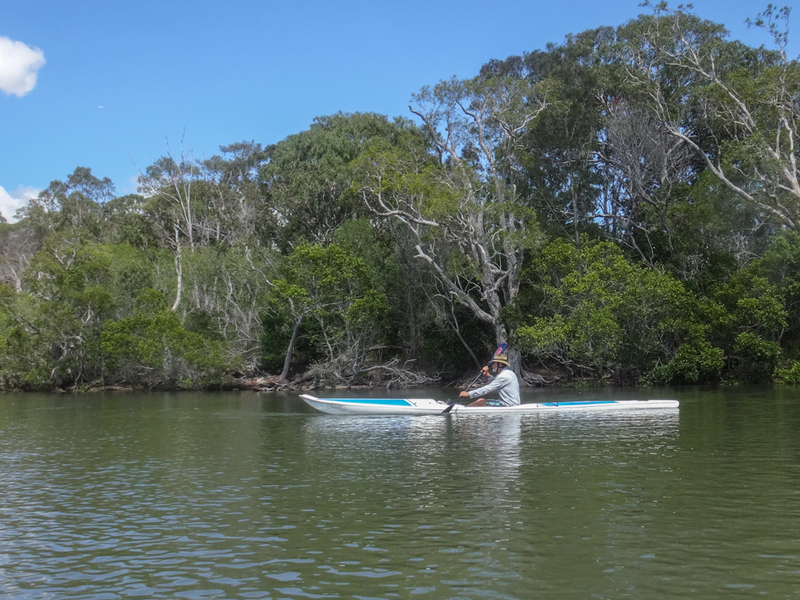 It’s hard paddling into a headwind, so I kept close to the “lee shore” (more seafaring jargon) using the trees to shelter from the breeze. 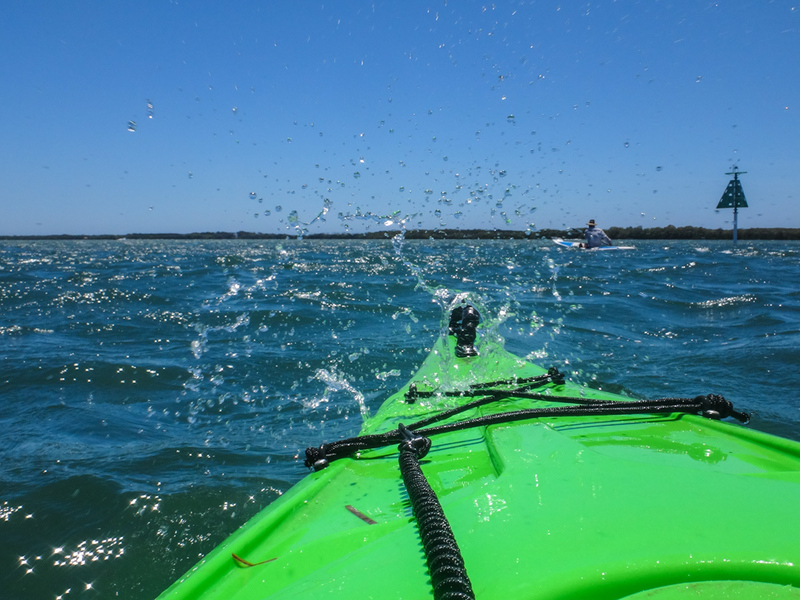 Back in the Bribie Passage, the strengthening breeze was starting to whip up waves. For the first time today we had to work hard, pushing into the wind. 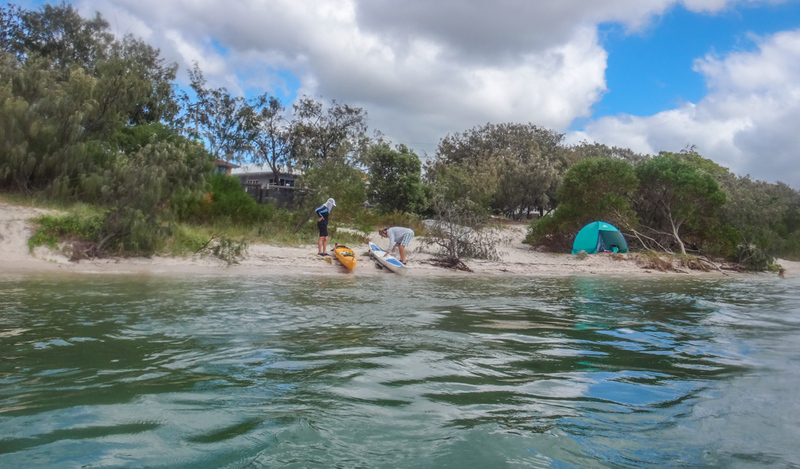 We crossed the passage, seeking shelter from the headwind near the shore of Bribie Island. It worked. 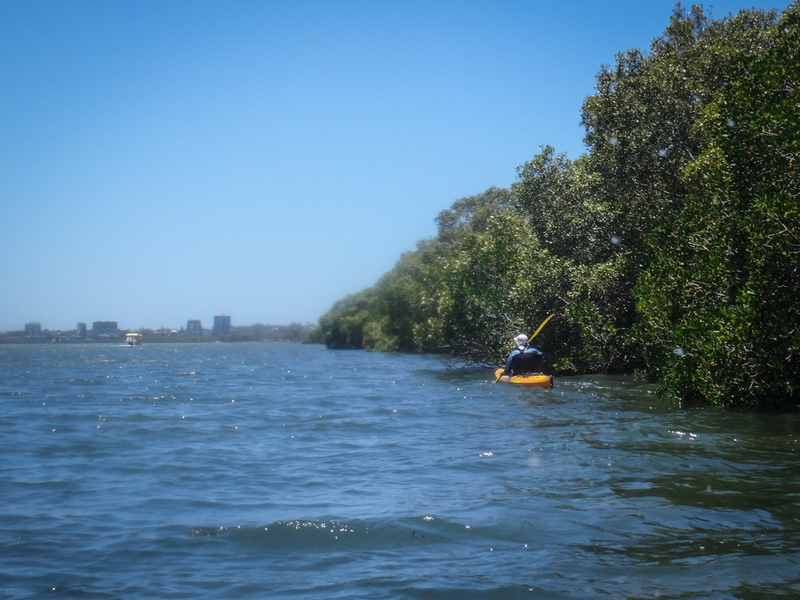 We dodged the strong northerly by staying close to the mangroves. 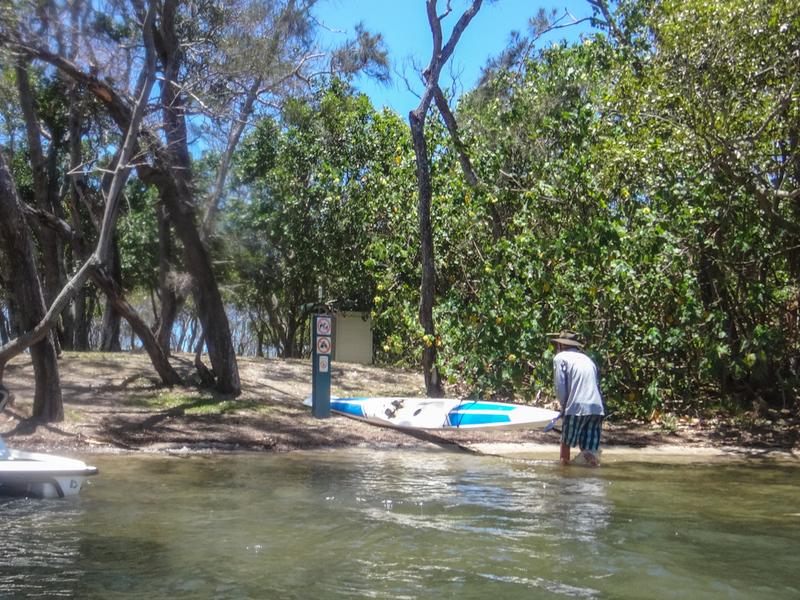 We eventually came ashore at the Lions Picnic Area. We last visited this secluded spot on Global Fatbike Day. 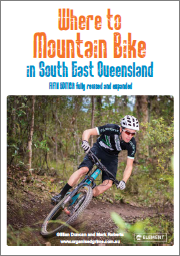 Somewhere in the back of my head, I rejoiced that I had joined up another gap in my ride map. 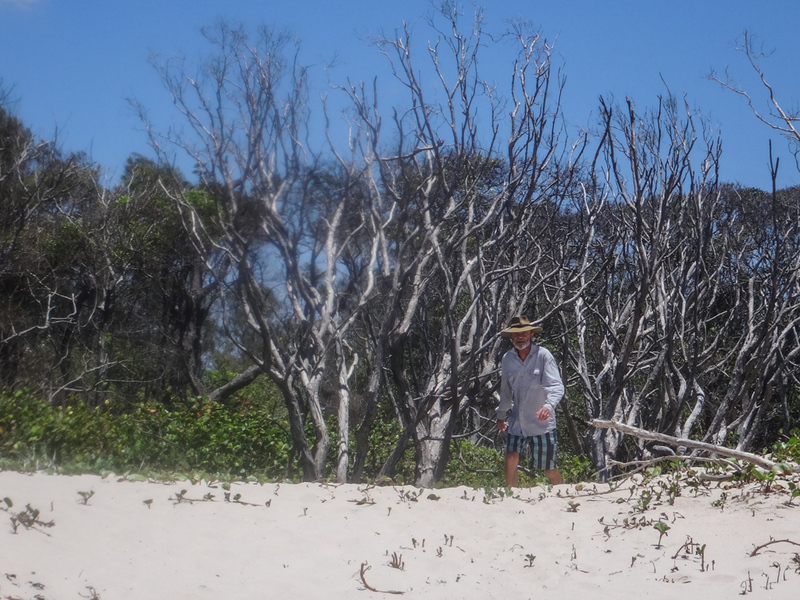 We wandered through the dunes to the beach. 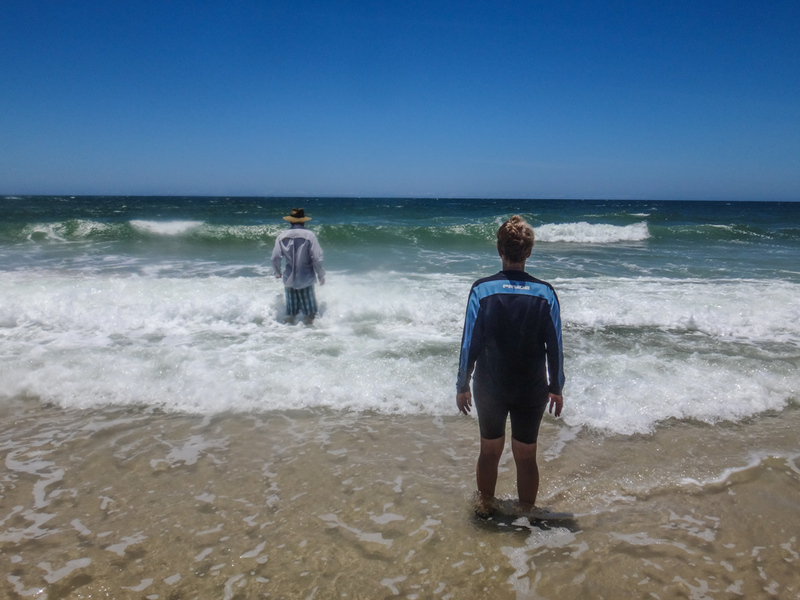 Calum decided it would be a good idea to cool off in the waves. 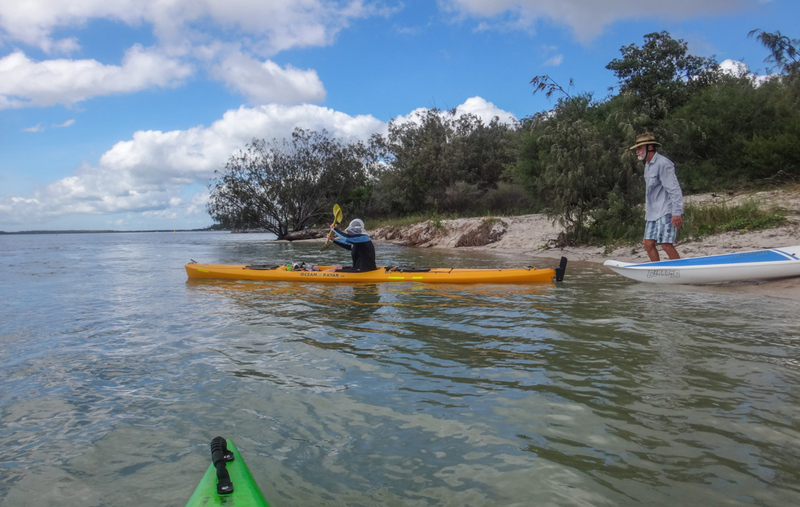 After another short break, we waded the boats back out into the water for the final leg of our adventure. The breeze was now quite strong. We used the shelter of the coast to briefly hide from it, but we eventually had to cross the passage and beat our way into the wind. It’s tough work paddling into a stiff breeze. Calum, ever the gentleman, helped Ruth by tying her boat to his, and giving her a “tow”. 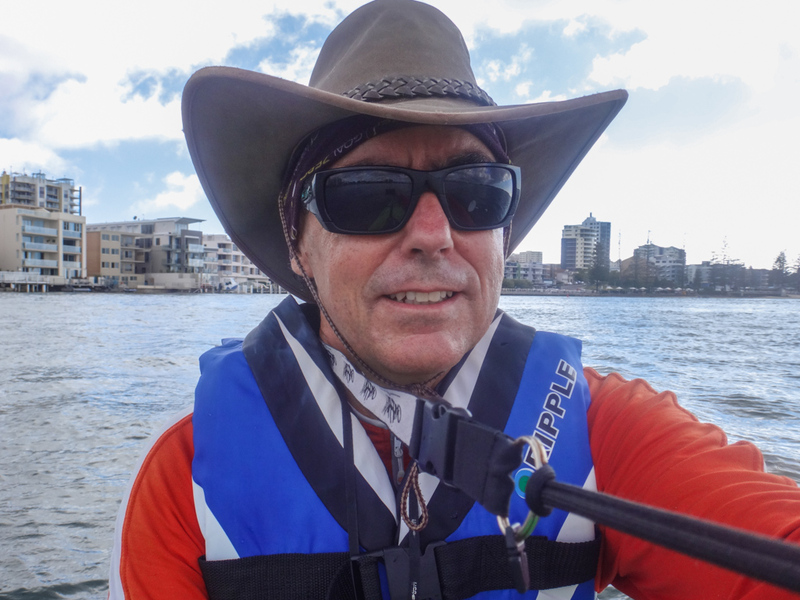 After a brief “goodbye” I continued my adventure along the passage on the outgoing tide. As the passage narrowed, the current gradually accelerated. 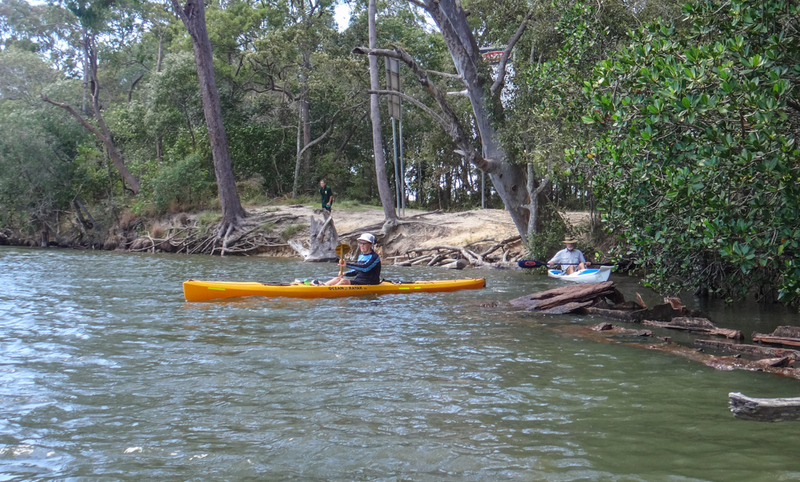 By the time I reached Bulcock Beach I was moving quickly downstream. “Freewheeling” downstream is a lot of fun – but the fast current made it quite difficult to get out of the kayak and back on to the beach. Thankfully someone was there to help me out and make sure I didn’t lose the boat. 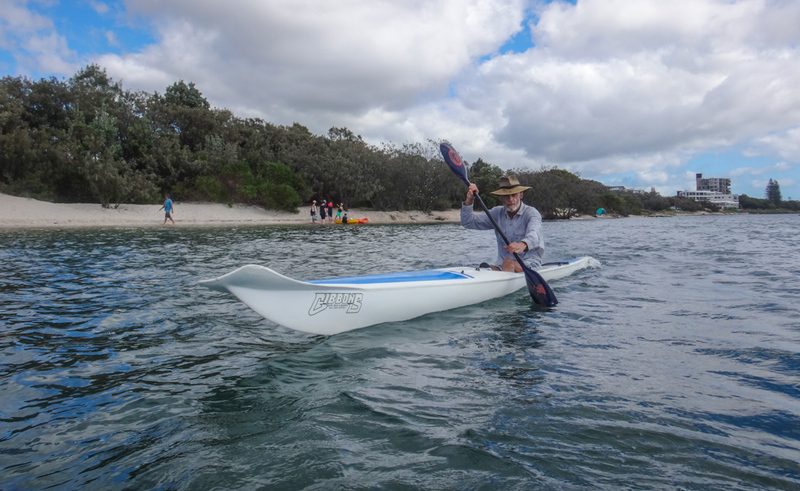 I paddled almost 19km in about five and a half hours including breaks. During that time I burned about 1,600 kcal. I’ll rate it 7.5 out of 10 on the tough-o-meter. Most parts of this trip were easy, but one or two segments were challenging. 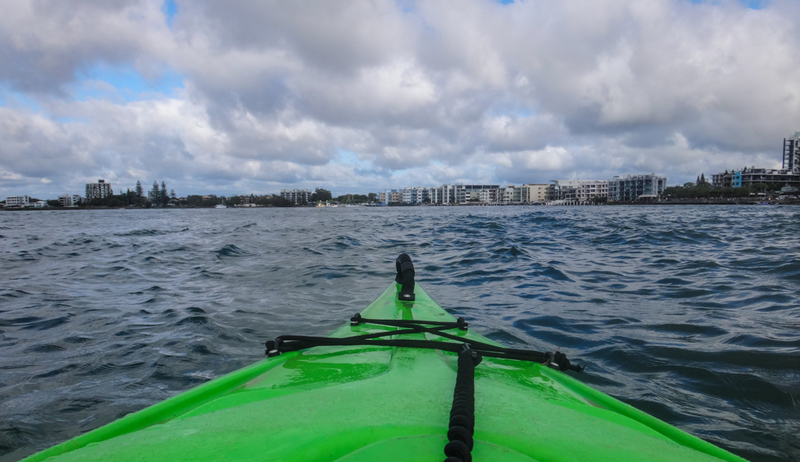 At the start of the day I had naively thought I could get a “free ride” by using the tides, but my plans were complicated by a strong headwind. Towards the end of the trip, that breeze cancelled out most of the advantage of the favourable tide. Thanks, Calum and Ruth for a fun adventure! What a gentleman Calum is! 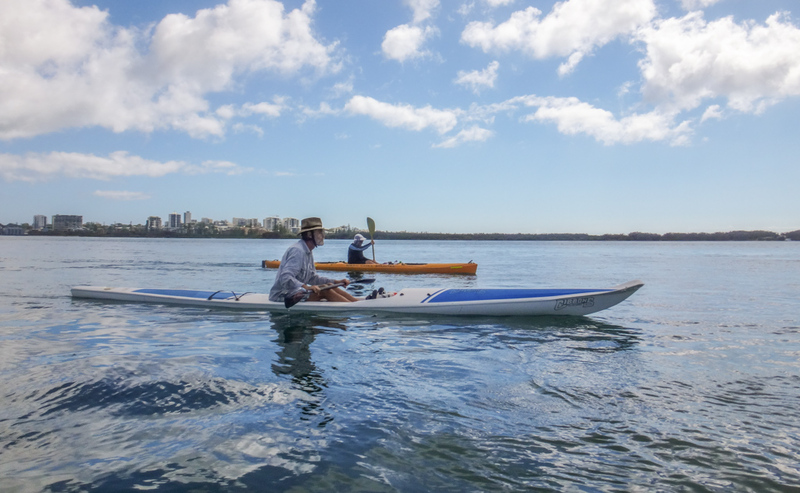 This looked so lovely… Something about being out on the water… Spewin (no pun intended) I was too sick to make it. Next time! !